I have visited Manchester many times, yet every visit gives me new thoughts. Manchester is the first industrialised city in the world. More than 200 years ago, it was in Manchester that the cotton industry was born. This was the prelude to the Industrial Revolution. It is fair to say that the world's industrial revolution was born in the UK, while the UK's industrial revolution was born in Manchester. This revolution led by Manchester brought profound changes to the UK and the whole world. Forty years ago, another "revolution" took place in China. It was reform and opening up. As President Xi Jinping said, it is "China's second revolution" that "has not only profoundly changed China but also great influenced the whole world." December 18th, 1978. That was the day the "second revolution" began. Exactly 40 years ago, the third Plenary Session of the 11th Central Committee of the Communist Party of China made the decision to start the great journey of China's reform and opening up. Forty years ago, China's GDP was only $175 billion, ranking the tenth in the world. Today, this figure has topped $12 trillion, increasing by 33.5 times in real terms and making China the second largest economy in the world. Forty years on, China's trade volume has increased by more than 780 times. It is now the world's largest trading nation with largest export and second largest import. It is a stabiliser and powerhouse for world economic recovery, contributing more than 30% of world economic growth for many years in a row. Forty years on, China has lifted 740 million people out of poverty and contributed to more than 70% of the world's total poverty reduction. Why has China's "second revolution" achieved such enormous success? I think there are three reasons. First, China has followed the trend of the times as it explores its development path. In reform and opening up, China has no textbook to follow. From rural to urban reforms, from pilot projects to wider application, and from economic restructuring to deeper reforms across the board, the only benchmarks for China are its national conditions and development needs. The centre of all work is the people. The intention and goal of reform and opening up are always to ensure that the people live happier, safer and have a stronger sense of achievements. Gradually, we have found a path of socialism with Chinese characteristics. This path has led China to a profound transformation. It is an effective way to development and modernisation. And it represents China's wisdom and solution in addressing the problems of human society. The second reason for China's success is that China has been open and inclusive in seeking greater integration with the world. Openness brings progress and isolation results in backwardness. In the past 40 years, China has embraced the world with open arms and set sail in the vast ocean of globalisation. From embracing foreign businesses at home to exploring access to the world market, from becoming a WTO member to proposing the Belt and Road Initiative, China has turned from a closed and semi-closed country to one that opens up on all fronts. In 2017, paid-in foreign investment in China topped $130 billion, increasing by more than 60 times compared with 40 years ago. China has become the world's second largest destination for foreign investment. China has also grown to become the world's second largest source of foreign investment. Starting from scratch, Chinese businesses have found their way into 190 countries and regions around the world and now possess a total overseas asset of more than $5 trillion. As China grows, President Xi Jinping proposed to build a community with a shared future for mankind. This idea embodies China's resolve to shoulder its responsibilities as a big country and share its development opportunities with the world. The third reason for China's success is that China has pursued win-win cooperation with other countries. The win-win spirit is at the core of the Chinese culture. Pursuing win-win cooperation is a major strategy for advancing reform and opening up. China always believes that no country should seek development at the expense of others. Globalisation means that countries of the world are all in the same boat and should row together. Inter-connected development is the only way to sustainable cooperation. This year marks the fifth anniversary of the Belt and Road Initiative. Since it was proposed by President Xi Jinping, the BRI has followed the principles of extensive consultation, joint contribution and shared benefits. It is now the largest platform for win-win cooperation between all countries in the world. In the past five years, trade in goods between China and countries along the routes has exceeded $5 trillion. China has invested more than $86 billion in these countries. These investments have created more than 240,000 jobs and contributed billions of dollars in tax revenue to the local community. Next year, China will host the second Belt and Road Forum for International Cooperation. It will be open to friends from all walks of life in Manchester. We hope to see you at the Forum. Manchester has been a pioneer in China-UK cooperation. 120 years ago, Archibald John Little, a merchant from Manchester, was the first man to steer a steam boat to Chongqing through the Three Gorges. 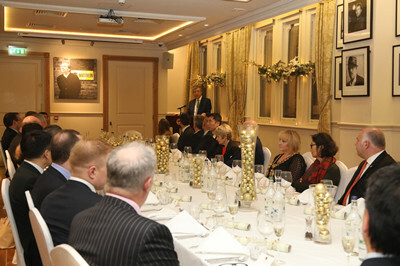 This trip opened the trade and economic links between the UK and the southwestern region of China. In 1986, with the establishment of ties with Wuhan, Manchester became the first British city to have a sister city in China and a trail blazer in the exchanges between Chinese and British cities. In the 21st century, Manchester United and Manchester City are among the first Premier League clubs to recruit players from China. Then came 2015 when President Xi Jinping visited Manchester. A new chapter started in cooperation between China and Manchester. Last September, Mayor Burnham led a business delegation to the Annual Meeting of the New Champions 2018, or Summer Davos Forum, in Tianjin. The trip also took him to Beijing and Shenzhen. By November 2018, Chinese investment in Greater Manchester had reached £2.5 billion. Beijing Construction Engineering Group International (UK) alone has signed agreements on four massive projects in Manchester. Chinese real estate companies have taken an active part in the real estate market and infrastructure building in Britain's northern cities. The Chinese automaker BYD has signed agreements with several northern cities to supply electric buses. This will help upgrade the public transportation in these cities. China and the UK are both at a critical stage of development. China will deepen reform and open up its market wider to the world. The UK is building a "global Britain" to expand trade and economic ties with other countries in the world. There is a broad prospect for deeper cooperation between China and the UK, including northern England. I would like to use "three S's" to share with you my suggestions on building closer partnership. The first S is "Synergy". There is a strong synergy between Belt and Road Initiative and the Northern Powerhouse strategy. The UK was the first major Western country to take part in BRI cooperation. It is a "natural partner" of China in advancing the BRI. One of the major goals of the BRI is to enhance connectivity and promote coordinated development of different regions. This is exactly what Greater Manchester is aiming to achieve, namely, leveraging the comparative strengths of different cities, counties and towns of northern England under the guidance of the Northern Powerhouse strategy. The governments of our two countries should look for such synergy between our development strategies and industrial policies to create conditions and opportunities for business cooperation. The second S is "Summit". This refers to the China-UK Regional Leaders' Summit. Since launched in 2016, this mechanism has made good progress and delivered fruitful results. With the active participation of cities from both countries, including Manchester, this mechanism has played an important role in enhancing regional cooperation and advancing the overall bilateral relations between our two countries. The fourth Summit was held in the Chinese city of Dalian not long ago. It calls on both sides to engage in mutually-beneficial cooperation with a global vision, greater initiative and a stronger sense of responsibility. I also wish to mention another mechanism, the China-UK forum on regional trade and economic cooperation and the meeting of the Chinese-British Entrepreneur Committee. It was held in Shenzhen at the beginning of this month. One of the agenda items of this meeting was how to deepen cooperation between the "Northern Powerhouse" region and China. Of the ten boroughs of Greater Manchester, six have established sister relations with Chinese cities. I hope that, building on the existing ties, the two sides could continue to leverage the China-UK Regional Leaders' Summit, in order to lift our mutually-beneficial cooperation onto a new level. The third S is "Sub-national Centre". We should build Manchester into a sub-national centre for cooperation between northern England and China. Greater Manchester is Britain's second largest financial, industrial and professional services centre after London. As one of the most attractive destinations for investment, Greater Manchester is home to more than 1,600 foreign businesses and a number of world-class commercial and research institutions. It has great strength in advanced manufacturing, automobile and aviation, high technology, chemical engineering, design and creative industry, energy and education. China has a competitive edge in capital, commercialisation capability, high-speed rail technology, equipment manufacturing and new energy. My friends here in Manchester told me that China has already overtaken France to be the third largest source of foreign investment in Greater Manchester. I hope that Manchester will seize the opportunities and leverage its comparative advantages to expand cooperation with China. I am sure this will boost the cooperation between central and northern England and China. The economic and trade situation is complicated and volatile. Unilateralism and protectionism are surging. Both China and the UK support economic globalisation, believe in trade liberalisation and uphold the multilateral trade regime. It is important that we hold high the banner of multilateralism and open economy. It is also important that we work to ensure economic globalisation becomes more open, inclusive and balanced. Sub-national cooperation is a crucial part of the overall cooperation between our two countries. 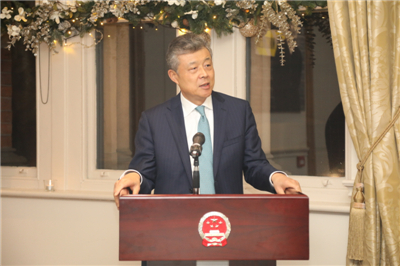 The people of China and Britain stand to gain directly from sub-national partnership. I hope that the business community in Manchester will seize the opportunities and make the best of these opportunities to expand and enrich the cooperation between China and Manchester. I also hope and believe, by working together, we will achieve new success in China-Manchester cooperation and create a brighter future for China-UK "Golden Era"!